SNMP provides custom designed automated monitoring and control systems for a variety of facility and energy management systems. 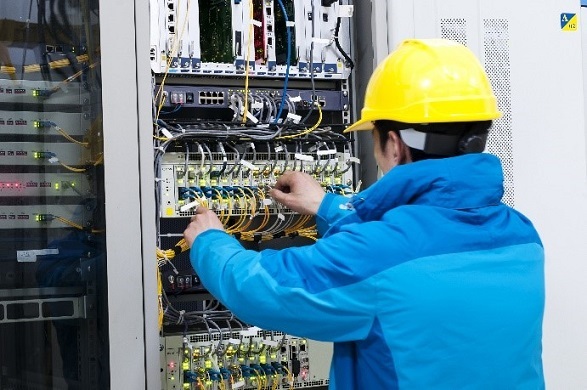 We have a team of industry qualified, experienced, and manufacturer-trained energy management and controls systems specialists, engineers, and application developers that are capable of tailoring disparate systems to meet various user applications. Engineer, design, develop, and integrate Energy Monitoring and Control Systems (EMCS) to meet a variety of customer needs (operations, performance verification, measurement & verification, reports, etc. Establish monitoring and control operational sequences providing the desired system responses, energy efficiencies, and occupant comfort and safety, while taking into account system lifespan and reliability. Create web enabled system dashboard and graphical interfaces to provide customizable reports and personalized data analytics. The Three main types can be broken down by function, operation, and requirements of the job. These types include: input, output and mixed modules. Input modules are capable of monitoring critical states within a HVAC systems such as boilers and chillers to monitor temperature, pressure, humidity, and flow. Air handling units – Monitor air temp using a thermistor to control the HVAC system. Chilled water systems – Used to monitor water temp and flow and adjust as needed within the system. Boiler systems – Monitors flow and pressure to make sure the system is preforming efficiently. Refrigerant systems – Will detect if the refrigerant systems are leaking Freon by measuring the pressure on the system. Computer Room – Used in the air handling units of computer rooms to control the air temp. To keep the computers at a safe operating temperature. System Security- Supervised point detection monitors the status of systems for cut or shorted circuits to prevent tampering with system integrity. 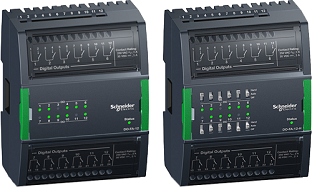 Output modules support output types Digital Form A, Form C, and Tristate. 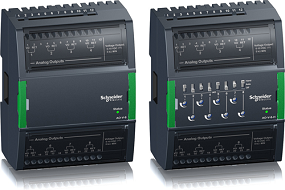 These modules will support a wide range of devices, such as valves, actuators and various other control devices. Return air fans – Control variable air and static fans as well as damper systems. Exhaust and supply fans – With these modules you can control the speed and opening within the fans. To accurately supply the correct amount of air flow throughout the system. Chilled water systems – The output modules can open and close valves as needed to make correct adjustments in a water system. Boiler systems – Can accurately make valve and actuator adjustments in the system to make the system run at top proficiently. Smoke Evacuation sequence - Can control fans and Dampers to respond to control from fire system and smoke evacuation protocols. Mixed modules combine the functionality of both input and output modules. They can be used to monitor and control certain systems that only require a few points of each type. HVAC. 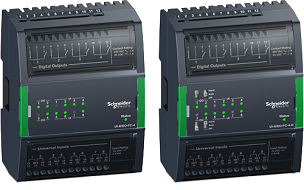 Monitor and control complete systems of a smaller scale to increase efficiency. Chilled water and Boiler systems. The modules will monitor water temp and pressure and adjust valves and actuators as needed. Computer Room Monitoring. To achieve the best atmosphere for the computers to live. Power is a complex factor within a building’s operation and monitoring it as part of building management is crucial. 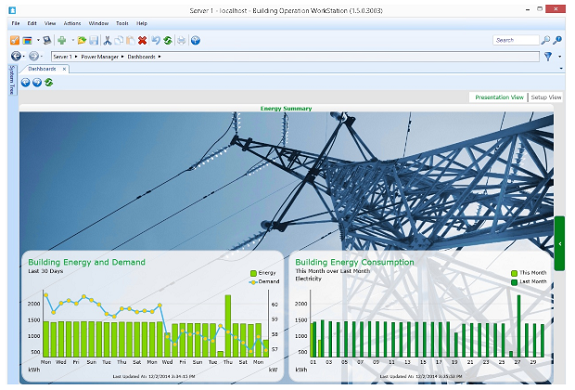 Power meters collect data from key points within the electrical infrastructure of a building and serve it up to Power Manager for EcoStruxure™ Building Operation, providing insight that helps owners and managers ensure electrical network health, increase power quality awareness and improve energy accountability. 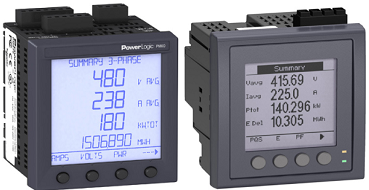 We offer a wide range of meter types, from very basic to highly advanced – but all will work seamlessly with Power Manager software. Typical applications can range from service entrance monitoring for utility bill verification to energy cost allocation between departments. 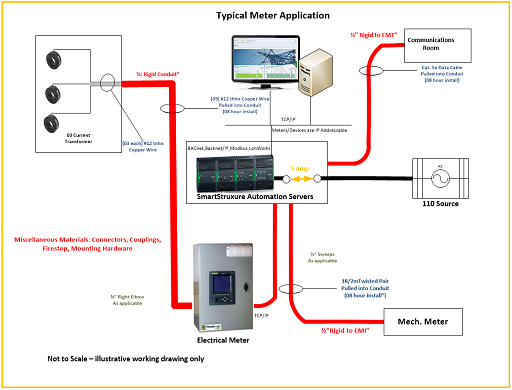 SmartStruxure™ Automation Servers can be used to read or recover information such as building energy demand and building energy consumption from meters. When integrating any digital meter with control devices for data collection, Current Transformers (CT) must be installed as indicated in Figure 1. The CT is a key hardware component required for measuring loads other than the source and meters itself. The transformer is polarized and must be fitted, the correct way round. CTs are marked with P1 and P2 to indicate which way they should be fitted around the cable or buss-bar. The side marked P1 must point towards the generator, and P2 must point towards the load. If an arrow is printed on the CT it must point towards the load. The CT outputs-secondary must be connected to the meter the correct way round. 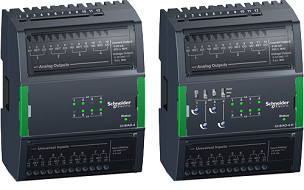 All current transformers are supplied with secondary terminals marked S1 and S2 which must be connected to the correct terminals on the meter. The meter will not register correctly if any of the CTs are connected incorrectly. The S1 terminal must be connected to the ‘current in’ terminal for the appropriate phase on the meter. On PRI meters the ‘current in’ terminals are the left-hand ones in each pair of current terminals. The S2 terminals should be connected to the ‘current out’ terminals for the appropriate phase on the meter. On PRI meters the ‘current out’ terminals are the right-hand ones in each pair of current terminals. The CTs must be connected to the correct phase inputs on the meter. The meter will not register correctly if the CT for L1 is connected to the inputs for L3 current, for example. For wound-primary CTs the section of the conductor nearest the generator is connected to the P1 terminal. The P2 terminal takes the section of the conductor leading to the load. Note that these terminals are at mains potential. All high voltage electrical installations that include CT’s are performed by licensed Electricians.